The new kid on the block is actually an ancient grain that has made a comeback. This Italian-born grain dates back to ancient Rome. While it’s sometimes confused with barley or spelt, farro has its own unique flavor and texture. Think of brown rice, only with a nuttier flavor and pleasantly chewier texture. Cook it in water or broth and it’s ready in about 25 minutes. One cup of cooked farro contains 220 calories, 5 grams of fiber, and 8 grams of protein. It will also give you a hefty dose of vitamins A, E and minerals like iron and magnesium. Farro is a whole grain, like barley, quinoa, and wheat berries. 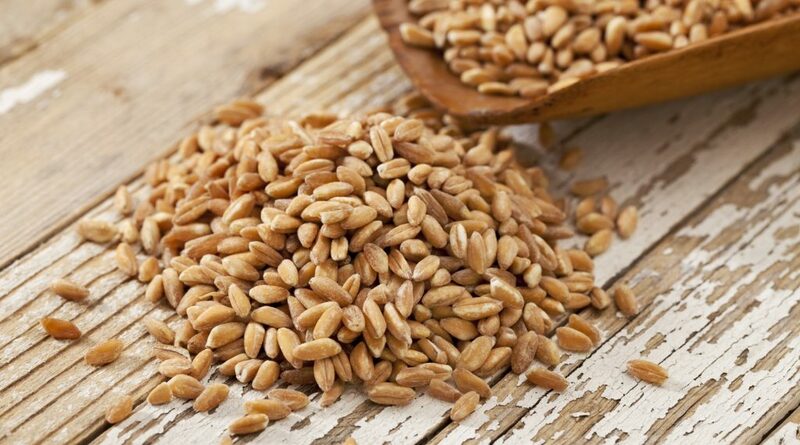 Farro is a specific type of common wheat, and like wheat, never gluten-free. Cook up farro and it’s ready to go in dozens of different directions. In soup, as a side dish or a main course salad mixed with vegetables, nuts, or fresh or dried fruit. Combine with beans, roasted veggies or chicken. Farro looks quite a bit like a more oblong and larger barley grain and has a similar taste and texture. Like barley, farro is still a bit chewy when cooked, rather than soft and mushy. Farro and barley can be used interchangeably in most recipes. Like quinoa, farro is referred to as an ancient grain, which means that it’s been around for generations. Keep in mind farro does contain more carbs than quinoa, but it makes up for that by offering a higher amount of calcium and supplying more than 10 different vitamins and minerals. Place the farro in a bowl, and pour enough hot water over it to cover by an inch. Let soak while you prepare the remaining ingredients, about 15 minutes. Drain. Heat the oil over medium heat in a large, heavy sauté pan. Add the onion. Cook, stirring, until it begins to soften, about three minutes. Add the mushrooms. Sauté until they begin to soften and sweat; add salt to taste, the garlic and parsley. Continue to cook, stirring often, until the mushrooms are tender, about five minutes. Add the farro and porcini powder. Keep stirring until the grains of farro separate and beginning to crackle, about two minutes. Stir in the wine and cook until the wine has been absorbed. Add 5 cups of the stock, and bring to a simmer. Cover and gently cook until the farro is tender, 50-60 minutes; Remove the lid, and stir to combine all ingredients. Taste and add salt and pepper if needed. There should be a little liquid remaining in the pot but not too much. If the farro is completely submerged, raise the flame and cook until there is just enough to keep it moist. If there is no liquid remaining, stir in the remaining stock. Place in a serving platter or bowl and sprinkle with parsley. This dish can be prepared in advance and warmed gently over low heat. Combine the water and farro in a medium saucepan. Add salt. Bring to a boil over high heat. Reduce the heat to medium-low, cover, and simmer until the farro is tender, about 30 minutes. Drain well, then transfer to a large bowl to cool. Add the tomatoes, onion, cucumber, and parsley to the farro, and toss to combine. In a medium bowl, whisk together the garlic, vinegar, salt, pepper, and olive oil. Add the vinaigrette to the salad and toss to coat. Serve.